LANSING — A nonprofit organization linked to Gov. Rick Snyder raised $2.24 million from anonymous donors in 2015, its first year of existence, according to a new federal tax filing. That’s more than the NERD Fund, a previous nonprofit organization connected to Snyder’s administration, raised over the three years it was active. From 2011 through 2013, the NERD Fund — also known as the New Energy to Reinvent and Diversify Fund — reported raising a total of $2.19 million. The NERD Fund’s most successful individual year was 2011, Snyder’s first year in office, when it raised $1.31 million. Facing criticism over the fact the fund was accepting money from anonymous donors, Snyder announced he would shut the NERD Fund down in 2013. His supporters then set up another nonprofit, Moving Michigan Forward, which voluntarily discloses its corporate and individual donors online. 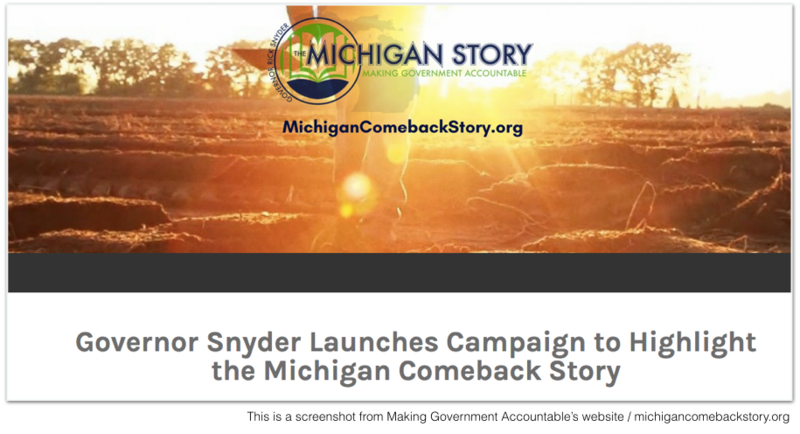 In 2015, however, Snyder supporters established Making Government Accountable, which hasn’t disclosed its donors, to help Snyder tell the “Michigan comeback story,” according to its new tax filing. According to the organization’s website, it was “founded under Gov. 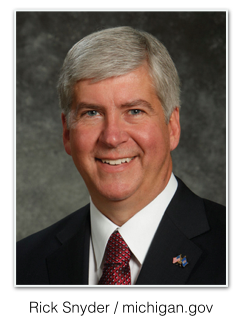 Snyder’s leadership.” The fund came at a time when Snyder was reportedly considering a campaign for president. Asked about the organization's fundraising today, Bettina Inclán, spokesperson for Making Government Accountable, said, "Making Government Accountable (MGA) reports all of it’s activity in accordance with state and federal law. MGA has been open on how we use our resources to promote the Michigan comeback." 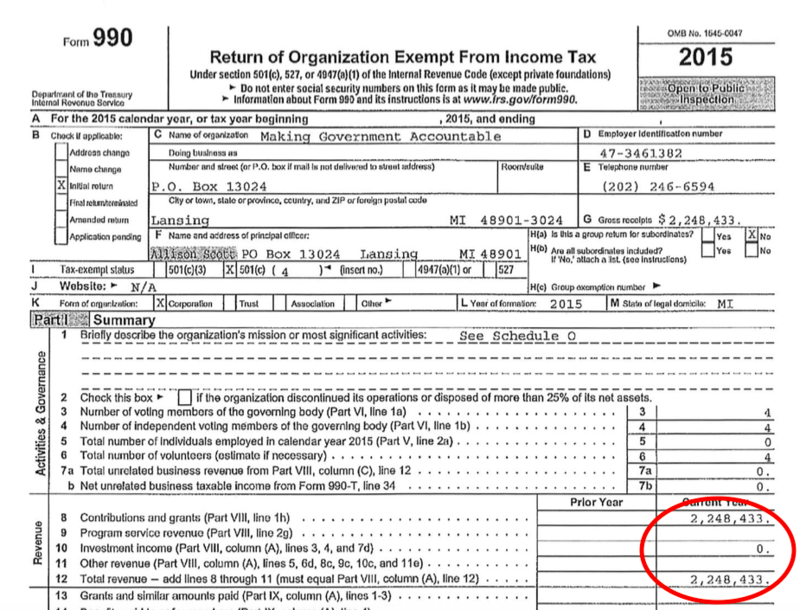 According to its new tax filing provided at the request of the Michigan Campaign Finance Network, the nonprofit has three directors: businessman William Parfet, who chaired Snyder’s Relentless Positive Action PAC; Doug Rothwell, president of the Business Leaders for Michigan and the chair of Snyder’s transition team; and Jim Brandell, government policy adviser for the firm Dykema. Its secretary is Allison Scott, who’s listed in official state documents as executive director to the governor. While Making Government Accountable raised $2.24 million in 2015, it reported $493,130 in expenses. Of that amount, $327,309 was spent on fundraising services, according to the tax filing. “This is accomplished through education, briefings and issue ads,” the filing says. The fund reported having $1.75 million in assets at the end of 2015. So far in 2016, according to other disclosures, Making Government Accountable has shifted $575,000 to other Snyder connected funds: Moving Michigan Forward; and a 527 account called the Governor’s Club. This fall, the fund also paid for TV ads touting Snyder and six state House candidates before the six candidates were on the ballot Nov. 8. The ads were announced in September at the same time Snyder’s PAC announced it was getting involved in the same six state House races. “I am proud that Making Government Accountable is highlighting the shared commitment of these six individuals to continue the Michigan comeback and focus on strengthening our state’s economy,” Snyder said, according to a statement on Making Government Accountable’s website. Unlike donors to the PAC, the donors behind the political TV ads don’t have to be disclosed because the ads didn’t expressly tell viewers how to vote. Making Government Accountable spent an estimated $315,000 on TV ads this fall, according to MCFN’s analysis of Federal Communications Commission filings and Kantar Media/CMAG ad-tracking data. In September, the fund began an initial wave of ads, amounting to an estimated $266,000, according to MCFN’s tracking. But another wave of ads rolled out just before the Nov. 8 election in some districts, amounting to an estimated $49,000.